On the 2nd Monday of each month, a group of talented bloggers share their themed creations for the month, be it Upcycling, family Recipes or Dollar Store Crafts. 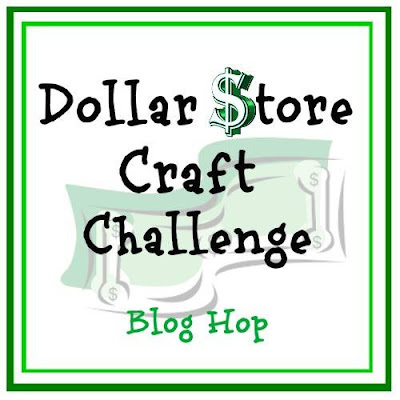 This month, it's Dollar Store Crafts, new or old! Everyone loves dollar store crafts so I'm really excited about this one! It's amazing what can be created with items from the dollar store! Can you imagine making adorable centerpieces of handcrafted foam flowers with crystal-like centers in large salt shaker vases filled with pebbles? Yes, I can and let me show you how you can, too! Large Salt Shakers - 5"
Begin by punching out lots of scallop circles from the foam sheets. If you don't have a puncher, just make a two inch circle pattern with scallop edges. You can count the holes in the shaker tops to see how many you might need. Then make slits in the circles every two scallop edges, stopping just before center. 4. Remove and lay on top of foam, pressing tip of handle down in center of circle, twisting to form flower shapes. Repeat to make more. 5. Next, cut floral wire into 4 and 6 inch lengths. 6. Then, add hot glue to the tip of the wire, swirling the wire around so the glue won't fall off. 7. Dip the glue tip into the seed beads, swirling it around. You can use your fingers to shape the beads around the wire while it's still in with all the beads to help with not touching the hot glue and getting burn. *Keep a cup of ice water nearby for touching the hot glue. 8. Remove and cautiously use your fingers to shape the beads round and let cool. 9. Insert opposite wire end into center of foam flower shape, pushing it toward the seed beads. 10. Add a dab of glue to bottom of beads and press foam flower shape together to form an adorable handcrafted flower. Love how the seed beads look crystal-like! 11. Fill the salt shaker containers with pebbles and screw on tops. 12. Insert handcrafted foam flowers into top holes, curving the wires and arranging at different heights. Then stand back and admire your lovely creations! Thanks for stopping by and we hope you've been inspired to make your own Dollar Store project! I always love your diy flowers, Gail. These are so cute! What a clever us for a salt shaker, too. I would never have thought of that. Love this! Pinning and sharing! Wow! I wish I had that much patience, they are adorable Gail! Gail those flowers are so pretty. And you have created them from nothing. That;s what makes your projects so incredible. They look super cute hanging out in the salt shakers too. Great idea! These are adorable! I never would imagined that heating the foam would help the flowers curl up! You are the best! Gail, Love these bright and colorful flowers!! I'm totally going to give this a try. Pinning and sharing! They are so cute. I don't think I have the patience anymore. A few craft projects here and there. I love to see what everyone makes from the dollar store. How pretty! And using the salt shaker with pebbles as a holder is genius! Gail, you always make the most adorable flowers in the most unexpected ways. Love these! Great tutorial too, as always. Que bonitas y no parece muy dificil. Voy a intentarlo. ¿tienes la plantilla de las flores?para poder intertarlo. I'm a newbie to your creative blogging world Gail, sent via Pinterest from your fabulous Monogram Shell project!! I never knew foam sheets could "puff" like that! How exciting to see it used in a different form other than flat! Super neat and oh so cute creation!! Well done! !